Surely one of the most spectacular orchids, Bulbophyllum Elizabeth Ann ‘Buckleberry’ (see picture right) is a hybrid of B. longissimum x B. rothschildianum. Previously knows as Cirrhopetalum Elizabeth Ann ‘Buckleberry’ so lets not get confused here, its the same plant. We first saw this plant in an Orchid show, and without doubt it was drawing a lot of attention. It might not have the brilliant colours of some other orchids, however with flowers that look like medieval tapestry it is a stunning plant. Although these could be a mounted specimen they do tend to get large, so better grown in a slatted orchid basket. Remember they have a fairly shallow root system, and require a fair amount of moisture. Although reasonably tolerant of temperature fluctuations they ideally require warm humid conditions in filtered light, no direct sun. A little drier in winter. As this is fairly slow growing orchid at the start as it matures it becomes a little more vigorous, the display of flowers will be magnificent in a fully grown specimen. Excellent when grown in a hanging basket with the flowers allowed to droop down. 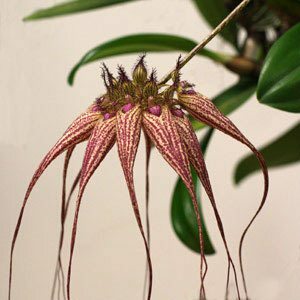 The flowers of Bulbophyllum Elizabeth Ann Buckleberry are striped, creamy white and dusky pink with long drooping tips, a spectacular display in full bloom.